BARELY A MOMENT (AUS) (Bay or Brown 2001-Stud 2006). 4 wins-2 at 2, VRC Sires' Produce S., Gr.1. Sire of 242 rnrs, 140 wnrs, inc. SW Moment of Change (MRC Sir Rupert Clarke S., Gr.1), So Swift, October Date, Back on Target, SP Awakened, Baby Boy, Demon Queen, Life is a Cabernet, Zest a Second and of Exalted Pleasure, Whipthebrewer, Brotherly Secret, Majestic Moment, Sudden Moment, Barely a Beat, Barely a Scent, Chestnut Charlie, etc. Danzadoozie (g. by Barely a Moment). Winner. See below. Mr Momentum (g. by Barely a Moment). Placed in NZ and Singapore. NIGHT'S UPON US (Military Plume). 5 wins-2 at 2-to 1400m, A$148,190, SAJC Queen Adelaide S., L, Pub Challenge 2YO H., MRC ET Barnard H., Bill Duncan H., SAJC Kidman Park Rotary Club H., 2d MVRC Silver Jubilee S., L, VRC Riverside H., SAJC Yallambee Stud H., KPMG Consulting H., Surround H., 3d SAJC Rustic Dream H., Smart Choice H. Producer. Espresso. 6 wins at 1200m, 1400m, HK$3,593,390, HKJC Fenwick H., Tai Lam Chung H., Purves Quaich H., Ash H., London H., Insular H., 2d HKJC Beijing H., Lai King H., Audemars Piguet Carnegie H., 3d HKJC Tokyo H., 1010 Platinum H.
Gee 'n' Tee. 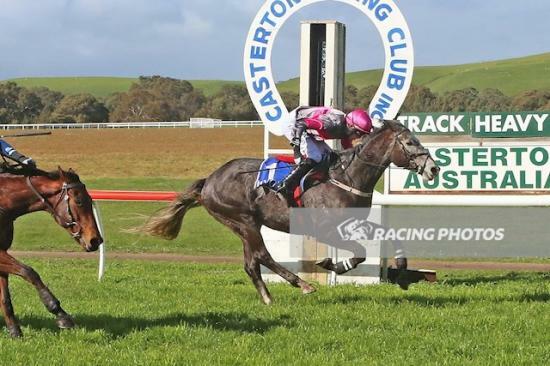 Winner at 1450m in Aust. Grey Danz. Winner. See above. Vintage Cognac. Winner at 1400m, 3d MRC (Mornington) Total Commercial Cleaning P.
Strikes Back (Ashkalani). 5 wins-2 at 2-at 1000m, 1100m, A$144,900, SAJC Legacy Brimco 2YO H., Solo Resource Recovery 2YO P., Sandy Nelson Teamwear H., Sealink H., 2d SAJC Cleanevent H., 3d VRC Maribyrnong P., Gr.2, SAJC Breeders' S., Gr.2, Fulham Park P., L, Oakbank RC Young Members Graze Greys H.
Little Sheeka. Winner at 1600m in 2014-15, TRC Raine & Horne P., 2d TRC Raine & Horne Alexandra 2YO P.
Aztec Sun. Winner at 1400m, 2d SAJC Marsh H., Historic City of Woodville H.
Comes the Dawn. Winner at 1100m, 3d SAJC Distinctive Homes 2YO H.
Horakle. Winner at 1000m, 3d SAJC Best Friend Magnetic Products H., Nautilus Estate H.
TWILIGHT PRECIEUX (Metal Precieux). 11 wins from 1100m to 1600m, A$126,015, SAJC City of Adelaide H., L, Trois Model H.-twice, Cameronic Welter H., 2d SAJC Swettenham Stud S., Gr.3, Playful Princess H., Reckless H., International Year of the Family H., Galaxy Television H., Holden Statesman H., Eagle Blue P., 3d SAJC Alsco Linen Services H., Midnight Fever H., Boardwalk Angel H., Carbine Club Trophy. Producer. Scorpio Lass. 10 wins from 850m to 1600m, STC Five Dock H., 3d AJC Sadlier H. Producer. English Twilight. 2 wins. See above. LAMBTON CASTLE (Blackfriars). 10 wins from 1300m to 2400m, A$284,800, WATC Detonator S., L, Festival of Perth Racing H., Final Print H., Hanging In H., Lawrence Business Management H., 2d WATC Gay Prince H., City of Belmont Community H., Country Challenge H., Sell Your Home Jones Ballard Property Group H., 3d WATC Diggers' Cup H., Northam Cup, WATC E-Vent Roof Ventilators H., 4th WATC Strickland S., Gr.3, Grandstand Cup, L, Tattersall's Cup, L, Kalgoorlie Boulder RC Boulder Cup, L.
Race Record: 20 Starts 1-2-2 A$20,580. Winner at 1800m in Aust.